We are still pondering the implications of the 2017 federal elections in Germany that propelled the far-right AfD to become the third-strongest party in the federal parliament. As new data on party positions and voter perceptions are becoming available, we took a look at the purported leftward shift of the Christian Democrats, Angela Merkel’s CDU. With the party leadership’s decision to open up the vote to allow for the introduction of marriage equality, including the possibility for gay and lesbian couples to adopt children; the decision to end nuclear power in Germany; and, most importantly, chancellor Merkel’s 2015 decision to open Germany’s borders for about 1.1 million refugees and migrants, the previously conservative party seemed to have veered far into the left field, particularly on a policy dimension that can be described as GAL/TAN –“Green, Alternative, Libertarian” vs. “Traditional, Authoritarian, Nationalist” (Hooghe, Marks, and Wilson, 2002). 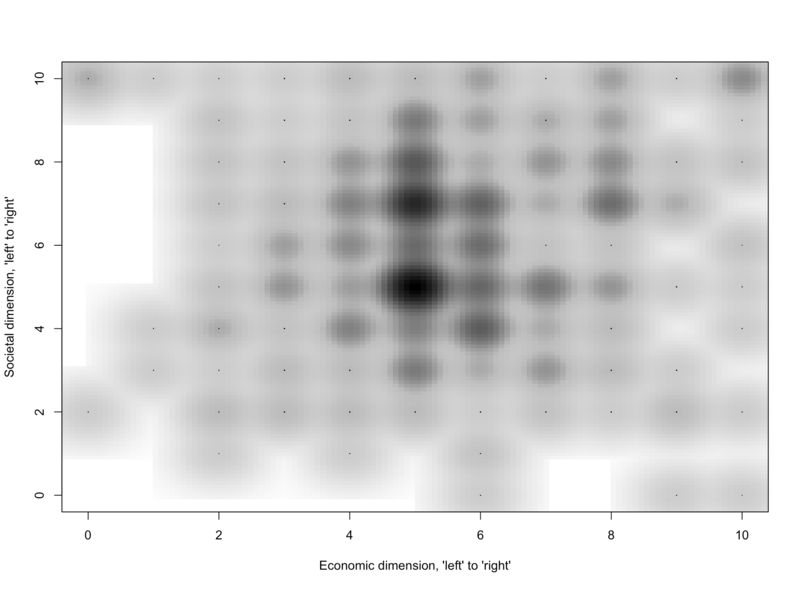 We can look at two kinds of position data to see if the claim of a leftward shift of the CDU is actually true. The first data source employs objective criteria in coding party manifestos to gauge parties’ positions. 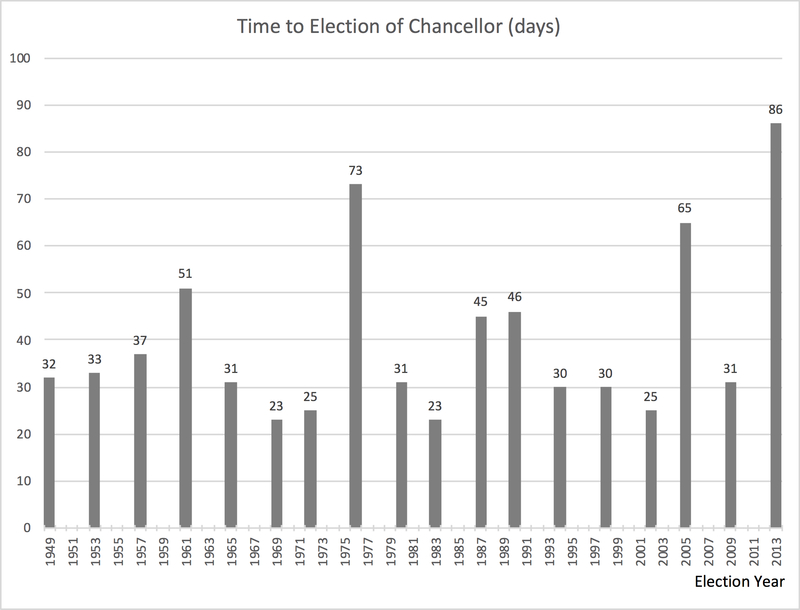 We used data from the Comparative Manifesto Project to compare the CDU’s position over time. The GAL/TAN variable we constructed takes positive mentions of a “national way of life”, “traditional morality”, “law and order” and negative mentions of “multiculturalism” as indicators of more right-leaning positions, while negative mentions of a “national way of life”, “traditional morality”, “law and order” and positive mentions of “multiculturalism” are indicators of more left-leaning policy positions. Normalizing the resulting indicator to a range from 0 (left-most position) to 100 (right-most position) puts the CDU at 45.35 for the 2017 elections. 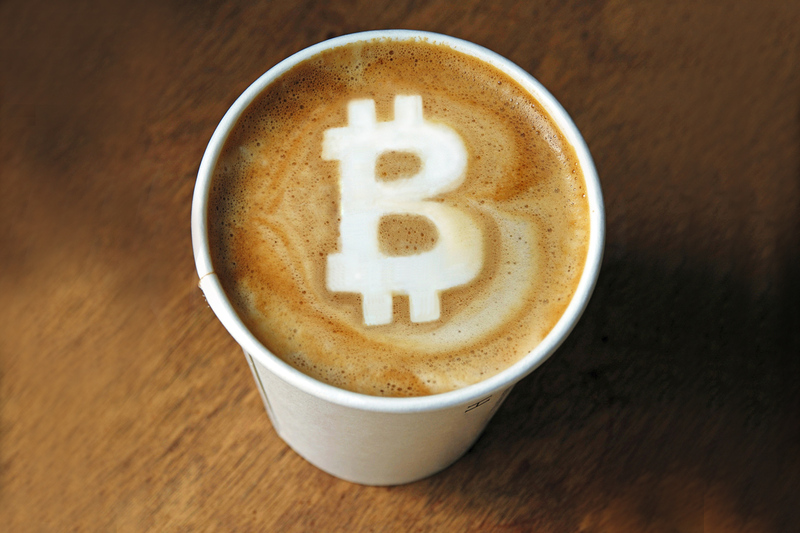 In 2013, this number was 44.68 – indicating that there was hardly any change at all. 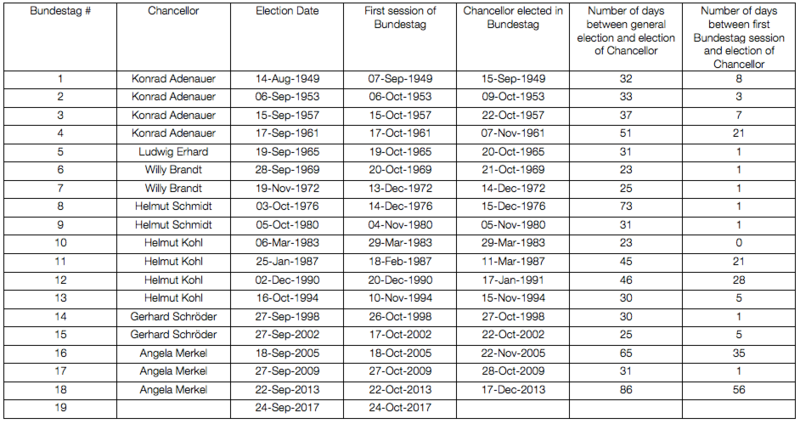 Going back further in time, the CDU is at 42.05 in 2009 and at 43.17 in 2005. This is certainly not a pronounced leftward shift. 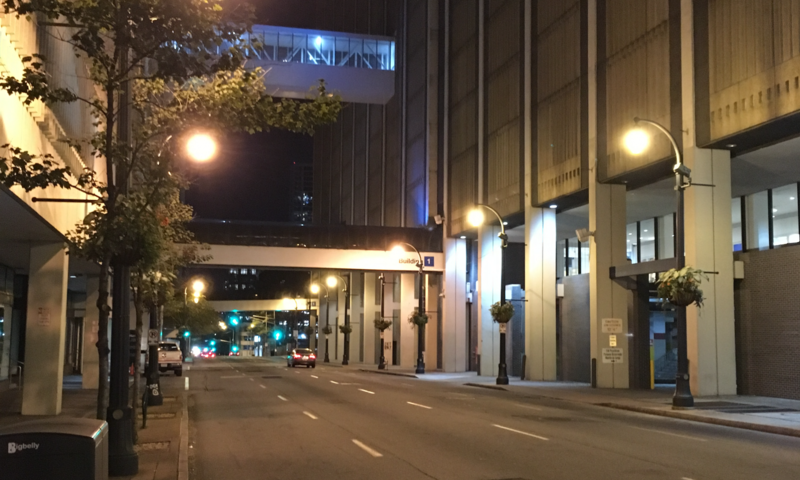 This result is corroborated by data from a second source, the Chapel Hill Expert Survey (CHES). The CHES data are compiled by asking political scientists what they think the positions of political parties in their country of expertise are. According to the CHES data, the CDU changed its position on the GAL/TAN dimension only moderately, from 6.0 in 2014 to 5.8 in 2017 on a 0 to 10 scale where 0 stands for the left-most position and 10 for the right-most position. Here is the interesting part: This notion of a party that remained essentially stable in their policy position on a GAL/TAN dimension is not shared by voters of the AfD. Using representative survey data from the German Longitudinal Election Study (GLES), we see that AfD voters see a pronounced shift to the left in the GAL/TAN position of the CDU. 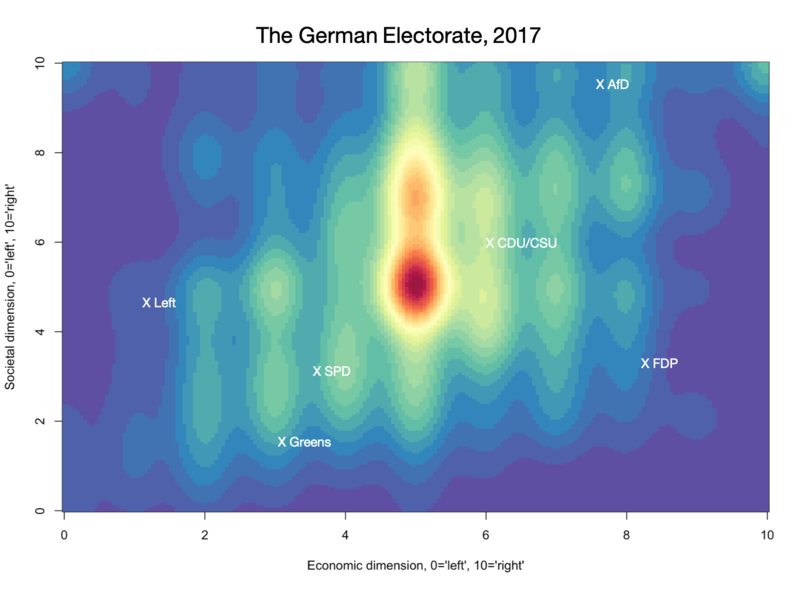 While, in 2013, non-AfD voters placed the CDU at 6.79 and voters of the AfD saw the CDU at 6.48 on the GAL/TAN dimension (the GLES data use a 1 to 11 scale, with 1 denoting left, 11 denoting rightward positions), this perception changed massively in 2017. AfD voters placed the CDU at 4.98, while non-AfD voters placed the party at 6.1. 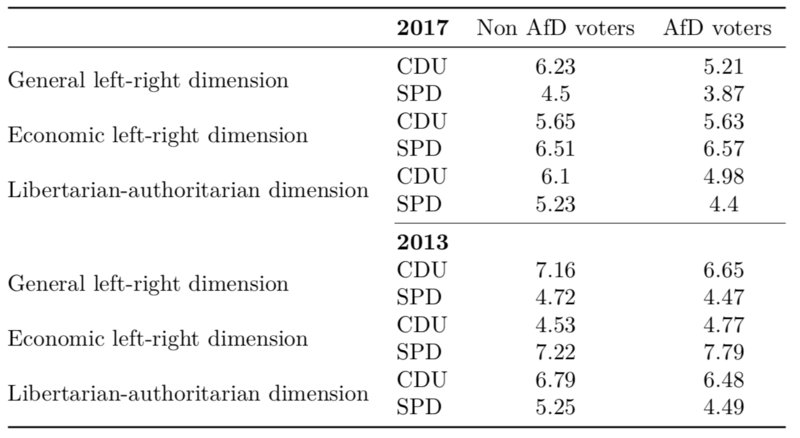 Put differently, the perceptions of voters who didn’t vote for the AfD are broadly in line with objective and country expert data on the political position of the CDU, while AfD voters massively overestimate the leftward shift of the CDU. This perception of a a pronounced leftward shift of the CDU on a new politics dimension by AfD voters also renders the CDU and the SPD more alike. In 2013, the perceived difference between the parties on the GAL/TAN dimension was 1.74 among non-AfD voters and 1.99 among AfD voters. In 2017, these differences changed to 0.87 and 0.58, respectively. The difference between AfD voters and non-AfD voters in the perception of the CDU in comparison to the SPD thus increased between 2013 and 2017. This is evidence of a successful mobilization that portrayed the CDU as being “too far” away from AfD voters’ ideal points and the AfD taking up the slack. The table below shows a summary of these results, together with data on the perception of party positions on a general left-right dimension and and economic dimension. Obviously, perceptions matter in politics. One interpretation of these findings is that AfD voters were looking for a reason to rationalize their support for a party that is at odds with much of the post-war political consensus in Germany. Casting the CDU as having swung massively to the left may just have done that trick. On Thursday, the German Social Democrat’s (SPD) party congress green-lighted talks with Chancellor Merkel’s center-right CDU that could lead to another grand coalition between the two parties (and the CDU’s Bavarian sister party, CSU). The Social Democrats had long resisted such a move, insisting that they needed to seek “renewal” in opposition. However, after the breakdown of talks to form a “Jamaica” coalition consisting of CDU/CSU, the Greens and the pro-market FDP, the pressure on the SPD was mounting. Actors from the German President, Frank-Walter Steinmeier, to a majority of the German public, to a majority of SPD supporters, called on the SPD to reconsider. The party’s price for entering a grand coalition could be a “radically different vision of Europe” as the Washington Post reported on Thursday. Mr Schulz called for a new Constitutional treaty to establish the United States of Europe by 2025. Countries that don’t ratify this constitution would have to leave the EU automatically. As a seasoned veteran of all things EU, Mr Schulz is probably aware that his proposal won’t fly in Europe. However, as far as German domestic politics is concerned, he may be on to something. Public sentiment in Germany is strongly pro-EU and a majority of Germans support more integration in the EU. These are the results from the most recent data from the European Social Survey. There is considerable support for an increase in EU integration, as figure 1 shows. More than 53 percent of respondents in Germany supported an increase in integration while another 15.7 percent (the mode) are in the middle between strong support for either of the two extremes (“European unification has already gone too far” and “European unification should be further”). This political sentiment is also reflected by the emotional attachment Germans feel towards the EU. Figure two shows that almost 62 percent of respondents in Germany score higher than the value of five; the value at the center of the distribution which can be taken to signify emotional indifference towards the EU. Both values are considerably higher in Germany than they are in the rest of the EU countries in the ESS sample. Support for further increases in EU integration in those countries is at around 35 percent, while positive emotional attachment is felt by 54 percent of respondents. What does that mean for Martin Schulz and the Social Democrats? If Mr Schulz is able to sell the SPD’s entry into yet another grand coalition as a feat that furthers the process of European unification, this should go down well with many Germans. 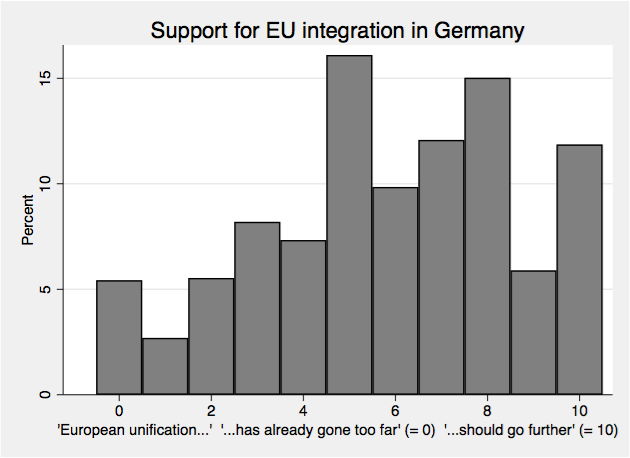 Support for the EU is strong and strengthening integration is viewed favorably by a majority of Germans. This could help Mr Schulz in overcoming resistance from within the SPD. Furthermore, EU integration is in the DNA of the SPD’s prospective coalition partner, with famed first chancellor Konrad Adenauer (CDU) being widely viewed as the father of “western integration” (“Westbindung”). Whether these positive views of the EU translate into German willingness to support more redistribution within Europe, as French President Macron’s plan seem to suggest, is, of course, another matter.